On the eve of battle, an army tears itself apart from withing. A new, unassailable force rises from the slaughter, with the power to raise the dead and harness wild gods. Malcolm Blakley’s fighters flee the battlefield, alliances shift and fail, and Malcolm himself is once more running for his life. Soon, he will find new allies, as deadly as those he opposes, and just as treacherous. In far-off Houndhallow, Gwen Adair and Ian Blakley’s pagan and celestial followers attempt to overcome their differences, but the consequences are sure to be deadly. 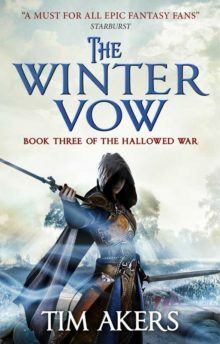 And the vow knight Elsa LaFey searches the wilds of Tenumbra for the key to end the war once and for all — the power of the Winter Vow. But time is running out, and the ultimate confrontation approaches.